III. Does the Self Assessment tax system simplify the procedure for the tax payers? Both Income Tax and VAT are self assessed taxes, but the regimes that govern then differ considerably. This assigment whats to compare and contrast the two taxation systems demonstrating clearly how each is administered and how the tax due is collected. “Self Assessment is a way of working out and paying tax.” (Inland Revenue, 2004a) Self Assessment is a tax system whereby tax payers are responsible for paying the correct amount of tax on set dates, without waiting for the Inland Revenue to demand this. The Self Assessment tax system is possible for Income Tax and Value Added Tax. The main principle on income tax Self Assessment is that the tax payers in the United Kingdom have to estimate their tax liability by themselves. Self-employed, company directors (et al.) have to make advance payments during the tax year. These tax payers are self responsible for the amount of the prepayment they want to pay. Payments are normally made in two instalments on 31 January and 31 July each year. Any balance due is settled the following 31st January. So much the better the tax payers evaluate their own tax liability to the Inland Revenue the less they have to remargin or to claim back. For the tax payers it is always better to prepay a higher amount of tax because interests for insufficient income tax prepayment are required from the Inland Revenue. On the other hand, the Inland Revenue pays interests for income tax refund. Most people whose income is wholly or mainly dealt with through PAYE do not need to complete tax returns. However, returns are sent to some people on PAYE, such as company directors, those earning £30,000 a year or more and a minority of pensioners. A list is given from the Inland Revenue in the Self Assessment Guide of all involved parties. 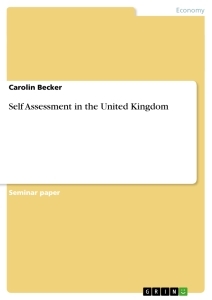 For those who complete tax returns, the UK has introduced the Self Assessment system in the tax year 1996/1997. The tax payers must, under this system, provide full details of their income and capital gains in the tax return. “These figures will determine, in the first instance,” (Hoereth and Utescher, 2002) the amount of tax tax payers will be required to pay (subject to any further checks that may be carried out). The Inland Revenue will calculate this bill for the tax payers, or the tax payers may calculate it their self. The Self Assessment tax return made up of a basic eight-page form. There are also separate supplementary pages - which ones they get will depend on their circumstances and the type of income they receive. One of the biggest changes is that the “… tax bill will be based on the figures, which the taxpayers provide on their tax return…” (Pommer, 2001) without the Revenue first checking them in detail and agreeing them. The Revenue will check them later, within a year of the final deadline for sending the return back to the tax payers (31 January). The tax payers need to fill in the return giving full details of all taxable income and gains they received in the year, and claim any allowances as well. This means that the tax payers are responsible for ensuring that they pay the right amount of tax, even if they do not actually work out the tax their self. Taxable persons should notify Customs and Excise when the vatable “… turnover for the past twelve months exceeds £58,000 … [and/or there are reasonable grounds for believing] …that tax payer’s turnover for the next 30 days will exceed £58,000.” (Kesti, 2004a) In the first case, notification must be within thirty days of the end of the relevant months. In the latter case, notification must be within thirty days of the date on which grounds first existed. It is important to monitor turnover because tax payers may be charged a penalty if they register late. This is an addition to the tax payable. Every quarter, a return is issued and must be submitted to Customs and Excise no later than thirty days from the end of the quarter. Returns and payments have to be made on time because extensive legislation exists to levy penalties on defaulters. Businesses with regular repayments may make monthly returns. Those using the Annual Accounting Scheme need make only one return per year, which has to be submitted two months after the end of the scheme year..
VAT is essentially a tax on consumer expenditure. If the supplier is registered for VAT and the supply of goods or services falls within the scope of VAT, the supplier will be responsible for charging VAT to customers at the appropriate rate (the supplier's output tax). Customers who are registered for VAT and intend to use the goods/services for business purposes are normally able to reclaim this VAT (the customer's input tax). VAT charged to a business by other suppliers is that business' input tax. When a company receives a VAT return, input tax is deducted from output tax and the remainder should be paid to Customs. If input tax is more than output tax, the difference can be claimed back. Control Self Assessment (CSA): Gibt es verschiedene Arten?